The V-Set devices are designed around a large bore, fast flow gravity fed infusions line to which any standard giving set may be attached. This line has an anti-reflux valve and includes a unique non-kink design, allowing fixing of the V-Set to the patient’s limb with a 180 degrees loop without fear of obstruction. 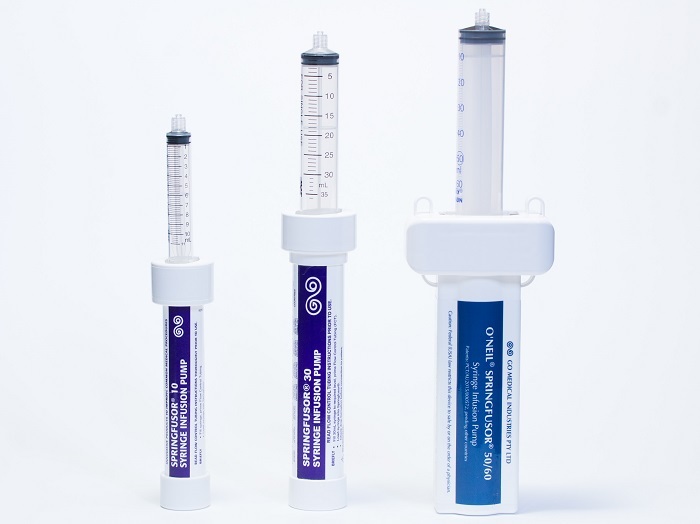 The Go Medical Springfusor® Syringe Infusion Pump and Flow Control Tubing (FCT) is intended to provide constant Intravenous (IV) or Subcutaneous (SC) infusions in either a 10ml, 30ml or 50ml configuration at a variety of pre-set flow rates to cater for all needs. Go Medical announces the initiation of the first US clinical study to evaluate the O’Neil Long Acting Naltrexone Implant (OLANI) for the treatment of opioid use disorder (OUD). Go Medical Industries Pty Ltd, an Australian company, is pleased to announce that as of August 10, 2018, the application for an Investigational New Drug Application (IND) submitted under section 505(i) of the Federal Food, Drug and Cosmetic Act for Naltrexone Subcutaneous Implant was granted. This allows Go Medical to progress with a development program in the United States towards fulfilling the regulatory requirements for a New Drug Application (NDA) via the 505 b(2) pathway for the OLANI as agreed with the FDA.